Reliable rental cars service spread over 250 destination in India. We offering you the best cab services in affordable rates. We provide many options of pick-up and drop-off as per your preferences. 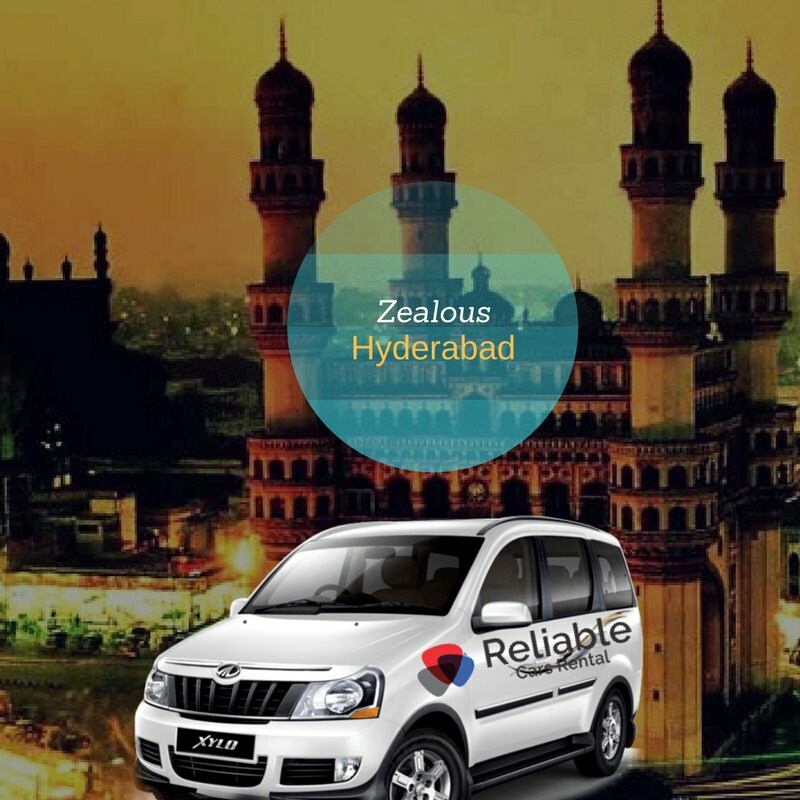 Whenever wanted to roam nearby places in Hyderabad, we provide lowest cab fare in Hyderabad. Whenever wanted to pick-up from airport to any places you can book our cab in low budget. Our main goal is to provide best services to our customers and maintain a good relationship with them, so they will trust on us and whenever they wanted to book a taxi they will choose our cab service. We primarily focus on giving the best value to your money. We provide lowest cab fare in Hyderabad. In this industry, trust is the most important factor. People trust us because of our good service. We have well trained, professional and skilled chauffeurs which makes your journey comfortable and safe. We provide cars according to budget of the tourists. We provide Tavera AC, Tata Indigo, Tata Indica, etc. For the luxurious journey, we provide cars like Mahindra Xylo AC, Toyota Itios, Mahindra Xylo, etc. Due to big IT hub,many employees comes to Hyderabad in search of jobs or for relocation. So, for going anywhere around you need to search for a cab which is time consuming and boring, you can avoid it by using our online booking service for portal which is user friendly and easy to operate to booking car rental. You can book a cab for ramoji film city booking to explore all the sceneries of Indian cinema or for finding the resorts around Hyderabad. We provide the clean, conditioned cars to give you comfort throughout journey. Customers get complete satisfaction and can fully enjoy the journey. We known for efficiency and quality since long time. Wanna go for outstation trip for roaming or work? You can book our cab or a business tour from hyderabad to any other city. You can rely on Reliable cars rental cab booking services all the time. Give us a call or book online and we will take care of your travel needs. Our experienced drivers travelled all across the cities nearby so travelling to new place will never be an issue for you. Just focus on your business or work complete and return home safely by using our cab services. Planning for Holiday with family or friends ? your joy level will be always kept high with our cab services. From hyderabad you can explore out some of the nearby places such as Bidar, Mehbubnagar,Warangal,Nizamabad,Nalgonda,Srisailam,Guntur,Kurnool etc. and explore the beauty of nature with gorgeous views. To get an amazing trip to travel outside Hyderabad, with lowest cab fare book car through Reliable Cars Rental. Hyderabad is a beautiful city know for its heritage and food. Hyderabad is capital of Telangana State of India, was founded on the River Musi five miles east of Golconda, the capital of the Qutub Shahi rulers in 1591-92 by Muhammad Quli Qutb Shah. Hyderabad is regarded as an extremely popular tourist destination. Often referred to as the ‘pearl capital’ of India, Hyderabad is quite well connected by air to almost all the major parts of the country. Reliable Cars offers a car on rent in an economic rates. Hyderabad is real treat for the lover of art, history, architecture with several tombs, places and mosques. This city is now popular for IT companies, big industries, pharmaceutical and biotechnology. These 21 magnificent domed granite tombs, with almost as many mosques, sit serenely in landscaped gardens about 2km northwest of Golconda Fort. During Ramadan, Hyderabadis line up for Shah Ghouses famous haleem (a thick soup of pounded spiced wheat, with goat, chicken or beef, and lentils) and at any time of year the biryani is near-perfect. This opulent 18th- and 19th-century palace compound, the main residence of several nizams, comprises several grandiose buildings and four garden courtyards. A stylish, sociable Belgium beer house that draws a refreshingly mixed-gender, mixed-age crowd. Order a beer platter for a sample of four choice brews or try the set lunch. A good reason to head out west to Hi-Tech City, this hip hang-out offers a contemporary take on North Indian street food Dhabas decor is kooky, with Bollywood-theme. A highly popular, cavernous brewhouse with five tap beers, including an English ale and a stout, plus cider. There are several zones, all stylishly lit and ample outdoor space. This noncommercial inclusive cultural space is an open centre that hosts plays, films, musical events, exhibitions, organic markets and lectures. It also has a great Irani cafe, with cheap tea and snacks. Hyderabad offers a number of tourist attractions ranging from Heritage monuments, Gardens and Resorts, Lakes and Parks, Museums to delectable cuisine and a delightful shopping experience. The signature monument of Hyderabad city. Situated in the heart of old Hyderabad city which is surrounded by Mecca Masjid. Char Minar is built in 1951 by Muhammad Quli Qutub Shah, using the bricks of Mecca and Laad Bazar. Birla Mandir is dedicated to Lord Venkateshwara of Tirumala Tirupati. Situated on the top of hill of 280 feet which is known as Naubat Pahad. The idol in the temple is a replica of the one at Tirumala Tirupati. Golconda fort is one the famous historical place in Hyderabad. This fort is located in the western part of the city. Golconda was the principal capital of the Qutub Shahi kings. The fort is famous for its acoustics, palaces, ingenious water supply system and the famous Fateh Rahben gun. Located just 2 kms away from the Hyderabad city, this is one of the most polpular tourist place in the city. Hussain Sagar lake is on of the largest man made lake. Known of its monolith of Lord Buddha situated right at the centre of the lake. One of the oldest and iconic landmarks that attracts pilgrims and tourist from all over the country. The name Mecca is derived from the mosque in Mecca. This 400 year old monument was built using the soil in Mecca. Salar Jung Museum is located on the southern bank of the Musi river. It is home to some rare collections of paintings, manuscripts, textiles and ceramics. It is located quite close to the other tourist spots of Hyderabad such as Charminar, Mecca Masjid etc..
Nehru Zoo Park is home to almost 1,500 species of birds, animals and reptiles. Spread over an area of approximately 380 acres, Indian Rhino, Asiatic Lion, Tiger, Panther, Giraffe, Gaur, Deer, Antelopes, Orangutan, and many more can be seen here. Situated at a distance of 30 km from the city of Hyderabad, Ramoji film City was constructed in the year of 1991, Ramoji Film City is one of the most popular sightseeing places of Hyderabad. Ramoji Film City has also place in the Guinness Book of World Records. Ramoji Film City has numbers of film sets such as London Street, Japanese gardens, airport, hospital, etc. , landscapes and buildings as well as laboratories. Contructed in 1994 under Buddha Poornima project by the Hyderabad Urban Development Authority. This place is named after the birth place of Lord Buddha. The Musical fountain and water cascades attract everyone. 2. We offer cabs at an affordable rates. Looking for taxi booking whole day when travelling first time in Hyderabad ? Hyderabad has been a city of migrants, either for education or for Employment. Traveling has been always tedious in unknown city like hyderabad. Our cab service provides genuine support for first time travellers in hyderabad city as well as our staff will be always there to take care of every possible hurdles our cab service customer. Cabs in hyderabad or drivers can be trusted ? Can we rely our parents, spouse, Ladies on them ? Our cab booking services in hyderabad takes care of your family, friends on top priority. Security has been always our speciality & 24 x 7 support is always there for any trouble. We hire professionally trained cab drivers and train them as per our policy which makes our car rental services most trusted in industry.